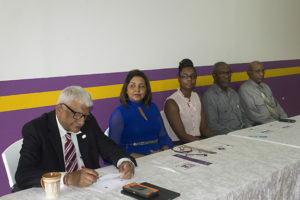 The University of Belize had a landmark ceremony for the naming of the students’ computer lab at the UB Belmopan Campus to the ‘Fultec Systems Computer Lab’ on December 18, 2017. Dr. Mariot Simon, Vice President of The University of Belize said in his welcome remarks, “This newly renovated computer lab is a representation of our National University.” The importance of this event to the University of Belize was evident in the attendance of the Dean and Chairs from each Faculty along with the UB Management Team. The Chairman of the Board of Directors, Harrison Pilgrim, also attended this event and offered words of gratitude. Mr. Harrison Pilgrim reiterated congratulations to Fultec Systems for agreeing to partner with The University of Belize to pave the way for growth and development of the National University. He hopes that another partner in the Belizean Community would consider following suit for one of the other labs on UB Campuses. UB’s President Professor Emeritus Clement Sankat, who takes every opportunity to invite the Private Sector to invest in UB, applauds Fultec Systems Ltd. for accepting the call to give. Our Private Sector partners reap the rich reward of getting innovative, creative and competent University of Belize graduates as their employees. Partnerships like these go beyond the day of the event, it benefits current and future students. President Sankat recognized the input of Mr. Michael Link, who assisted during the time he was Director of Information Technology and Mr. Abdulaziz Sanderson, current Director of Information Technology for their technical expertise. He also extended gratitude to Mr. Francis Burns for working on the layout and sourcing the quality computer desk work stations. 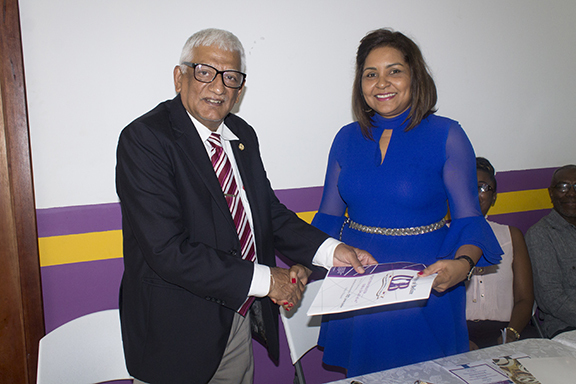 President Sankat recognized Mrs. Sherlene Julien, Director of Finance, for the liaising with General Manager, Mrs. Diana Fuller from Fultec Systems and working on the conditions of the memorandum of understanding (MOU). President Sankat also hopes that more partners from the Private and Public Sector will offer support to UB in upgrading facilities for our students. He said this was therefore a historic, landmark day for UB. President Sankat says he looks forward to the day when there will be the ceremony to name one of UB’s faculty after a Private Sector Benefactor. President Sankat said he is very pleased with the conditions of the MOU especially for the $5,000 donation towards the Endowment Fund to provide scholarships to deserving students for them to further their education at UB and the $30,000 in cash and “in kind” support from Fultec Systems which will assist with the upkeep of the computer lab. After the unveiling, those present were able to view The Fultec Systems Computer Lab that is equipped with 70 new computers. The expansion of the lab sets the stage for the strategic focus of UB’s institutional development through improved facilities and services provided to students. 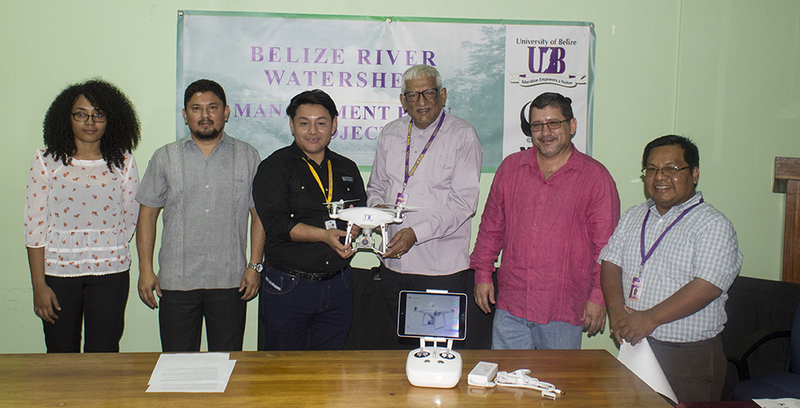 On December 19, 2017 at the Faculty of Management and Social Sciences (FMSS) Campus, in Belize City the President of UB, Professor Emeritus Clement Sankat was present to receive a drone from Mr. Mauricio Mejia, World Wildlife Fund (WWF) representative. The drone that was purchased with project funds from WWF is a DJI Phantom 4 PRO. In addition, an Apple Ipad, was also purchased to be used for aerial surveys to collect data required for the management plan and for future research work at the UB. This was a part of an ongoing stakeholder consultation through the Natural Resource Management Program from the Faculty of Science and Technology which started on October 13, 2017 at The Dream Valley Resort, to develop and inclusive watershed management plan for the Belize River. Thirty-three (33) participants representing twenty-one (21) organizations from the NGO, Government and Private Sector were present at the event. The opening ceremony included remarks by Dr. Mariot Simon, UB Vice President; Mr. Martin Alegria, CEO of the Department of Environment; Dr. Juan Carlos Rosito, Oficial de Hydrologia de WWF Guatemala; and Dr. Abel Carrias, Project Grant Administrator. The stakeholder consultation included a presentation by Mr. Antonio Cano, Project Coordinator, and was followed by a Stakeholder Mapping Survey and a Problem Tree Analysis Activity. The stakeholder mapping survey revealed the willingness of eleven (11) organizations to share data pertaining to Land Use, Waterbody & Watershed Conditions, & Socioeconomic Conditions of communities within the watershed by the end of November to support the project. This survey also identified nine (9) additional organizations that should be included in future consultation and who should be contacted with regards to this project. The problem tree analysis identified the following salient issues for the Belize River Watershed: erosion, water pollution, biodiversity degradation, increasing uncontrolled human activity, human and species health threats, and lack of legislative enforcement. The first stakeholder consultation meeting effectively introduced the project to stakeholders. Efforts are now ongoing to liaise with key stakeholders about obtaining pertinent data for the watershed. Following the first stakeholder consultation meeting, two additional stakeholder consultation meetings were planned for the month of December. On December 19th and 20th, meetings were convened at the University of Belize campuses in Belize City and Belmopan respectively. These meetings were to consult with community leadership and Farmers. This includes village councils, town councils, water boards, cooperatives, small-scale and large-scale farmers and supporting entities such as the Rural Development Department. Other equipment that will be purchased through WWF are a ysi 5500 photometer, a camera, and reagents for spectrophotometry. This equipment will greatly assist in the successful execution of the project, and will support further research and learning at the University of Belize. President Sankat is grateful to Fultec Systems Ltd., The World Wildlife Fund and all partners that have helped the University of Belize on its Transformation Plan to execute on UB’s Mission Statement to a commitment to excellence in higher education, research and service for national development.